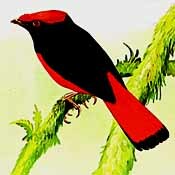 The Guianan red cotinga (Phoenicircus carnifex) is a species of bird in the family Cotingidae, the cotingas. It is one of two species in the genus Phoenicircus. It is found in northeastern South America in the Guianas in Guyana, Suriname and French Guiana; also a small border region of adjacent eastern Venezuela. In Brazil the species is found in the lower Amazon Basin bordering the Guyanas at the Amazon River outlet, and only ranges upstream in the Brazilian states of Pará, and Amapá. It is found on Marajó Island and southwards into northeastern Pará. There is a minor intersecting of the Guianan red cotinga range with the only other species in Phoenicircus, the black-necked red cotinga. ^ BirdLife International (2012). "Phoenicircus carnifex". IUCN Red List of Threatened Species. Version 2013.2. International Union for Conservation of Nature. Retrieved 26 November 2013. Photo-High Res; Article www.mnh.si.edu—"Biological Diversity of the Guiana Shield"